Comcast and skeptical lawmakers sparred Wednesday over the merits of a proposed mega-merger with Time Warner Cable which would boost the position of the largest US cable and broadband provider. The huge cable, Internet and media firm defended the deal as some senators expressed concern that it would concentrate too much power over Internet and cable access, and one consumer advocate said it would create a market "octopus." The $45 billion tie-up "will give us the scale and reach to innovate and compete against our national and global competitors," said Comcast vice president David Cohen at a Senate Judiciary Committee hearing. He said consumers would benefit from "more investment, faster Internet speeds, better technology (and) more Americans connected." 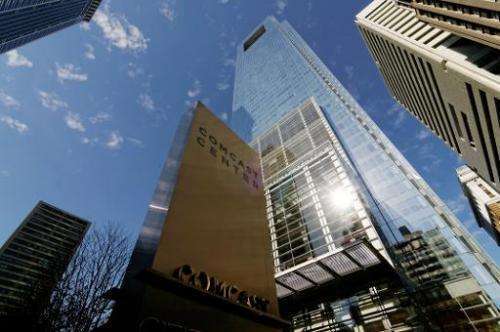 Cohen said that while Comcast would expand its footprint with TWC, it must compete against similar services from telecom operators AT&T, streaming providers like Netflix and others such as Google through its fiber and video services. While the deal is being reviewed by US antitrust regulators, objections in Congress could complicate the huge merger of the top two US cable companies. TWC vice president Arthur Minson told the lawmakers that the companies face "robust competition from a wide range of national and global companies," and that "we must adapt in order to succeed." But some senators remained unconvinced of the benefits. "There is a sense of skepticism among consumers," said Senator Richard Blumenthal. "Prices won't go down, so where's the beef? Apart from the fairly vague potential promise of good things happening, the case has yet to be made that consumers will benefit in any real, tangible way." More emphatically, Senator Al Franken said he opposes the tie-up. "We need to question whether this merger is good for consumers and good for competition," Franken said. "I'm against this deal because I think it does not meet either test," Franken said, adding that he expected "fewer choices and higher prices" if the deal goes through. But Senator Orrin Hatch cautioned against any move to block the deal. "Too often, government intervention in these matter risks harming innovation," Hatch said. "Consumers benefit when the markets are allowed to allocate resources in the most efficient manner. Government regulators must be careful not to intervene unwisely in such technologically dynamic markets." Gene Kimmelman of the activist group told the panel meanwhile the deal would create a titanic competitor with unprecedented power. "This would create a nationwide octopus... squeezing innovation," Kimmelman said. "If we want more innovative, low-priced services, this merger must be rejected." Christopher Yoo, an antitrust expert at the University of Pennsylvania, maintained the deal would have little or no competitive impact because the two firms operate in different areas with limited overlap. "The lack of any overlap means that the merger is not likely to affect the prices consumers would pay," Yoo told the hearing. Analysts have said regulators would carefully scrutinize the deal, not only due to the creation of a dominant cable and broadband operator but because of Comcast's ownership of one of the major television networks and Hollywood studios, NBCUniversal. Comcast, in acquiring NBCU, agreed to abide by so-called net neutrality rules that bar discrimination against competing online services. But Comcast raised eyebrows earlier this year with a separate deal with Netflix in which the streaming video service would pay for smoother delivery, which could set a precedent for other online services. Big cable deal: Service go from bad to worse?